Moe had some very bad luck and then his luck changed. It started when his owner died and Moe lost his family and his home. Then he got loose and was struck by a car. Thankfully a Good Samaritan provided the necessary surgery and then asked if we could provide future care and recuperation. Of course, we opened our arms to this sweet guy. Moe is a very handsome 14-month-old Siberian puppy with Agouti coloring (www.huskycolors.com/agouti.html). He is very friendly with people of all ages and other dogs. 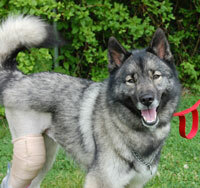 Despite the discomfort Moe must have been in, he met us with tail wags, a big Siberian grin and plenty of kisses. The hardest part of Moe’s care will be keeping him quiet for the next six to eight weeks while he heals. Moe is healing nicely and when vet approved, he will be ready to find a furever home where he can be a VIP (very important pooch). Of course, he will need a safe and secure home to keep him safe and sound.